The StoryBrand community is large and growing, and businesses all over the world are hopping onboard and using StoryBrand to improve their marketing and drive more sales. The first place you should consider using StoryBrand principles is your website. The homepage of your website is your first, best chance to introduce yourself, your products and services, and why customers should care about you. This is a great example of a StoryBrand-ed website. Here, we’re looking at the header. There are several key elements that this header gets right. Take notes! First, a big and bold headline that leads right into a clear, well-defined call-to-action. Your website simply must have a headline that grabs attention, and it must clearly tell the reader what you want them to do next: in this case, request a meeting. Next, we dip into one of the seven elements of the company’s BrandScript: “Success”. Success is portrayed in the picture behind the headline, a smiling couple on a beautiful beach. When possible, include pictures of happy customers whose lives have been transformed for the better by using your services. Finally, an interesting take on the “value stack”. The value stack is a simple set of blocks or tiles that describes at a deeper level the value your customers will receive when working with you. 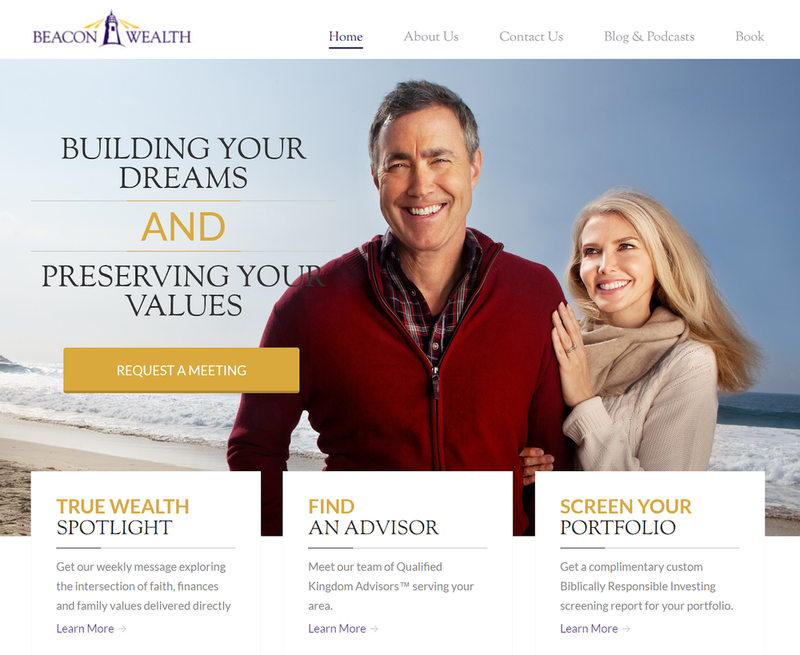 In this example, the company has chosen to use the value stack to, quite literally, spell out their values: responsible, Biblically-guided investing. This company decided to go a different route from our first example. Whereas Beacon Wealth set up an “aspirational identity” for their customers (by appealing to their desire for responsible investing) HomeGrown Financial has been more literal. Both approaches can work as long as you are clear about what you’re saying! So, our headline is very literal, telling customers both what they will get from engaging HomeGrown (an enriched retirement) and how that will be accomplished (reverse mortgages). Once again, we have a nice, clear-cut call-to-action. That same call-to-action is repeated in key locations further down the page, a hallmark of a StoryBrand-ed site. ﻿Finally, our last example of the day. Again, this company has chosen a literal path for their header. They state what the customer wants (an enjoyable retirement) and how they help folks get there (informed, smart decision-making). This value stack is a bit more traditional. 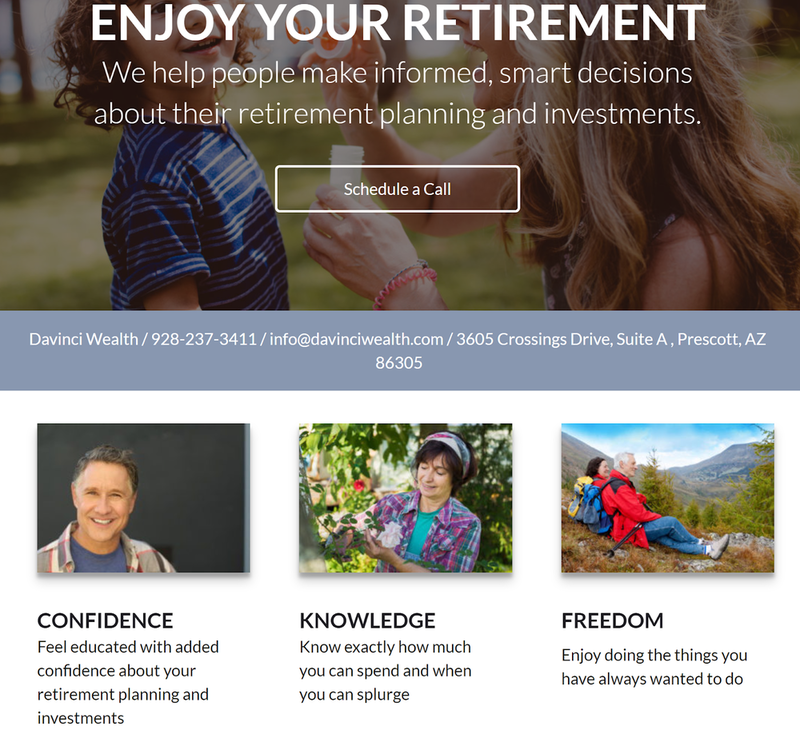 We have here the 3 key things that customers will receive when they work with DaVinci wealth: Confidence, Knowledge, and Freedom. A little bit of explanatory text helps paint the picture more clearly. As you scroll down the page, you’ll see more elements of StoryBrand: language that portrays the customer as the hero, repeated calls-to-action, and a simple, 3-step plan for engaging DaVinci’s services. And there you have it, a quick look through three well-done, StoryBrand-friendly websites for financial service providers. But just because StoryBrand is powerful doesn’t mean it’s easy to wield. All three of these companies chose to work with a StoryBrand Certified Guide to write and design their sites. If you’re feeling stuck with your own website, consider reaching out to Lantern today. We are a team of StoryBrand Certified Guides who help professional service firms focus their message, drive sales, and fuel their marketing. Older PostAre You Really Customer-Centric?